Everyone is familiar with the term ‘spring cleaning’. But did you know that checking more than your closets can have a dramatic effect on your homes performance throughout the year? Don’t let small problems grow into major repairs. 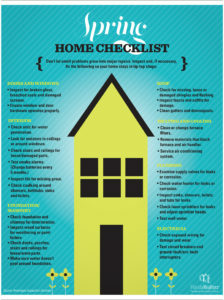 Inspect and, if necessary, fix the following so your home stays in tip-top shape. Inspect for cracked or broken glass, breached seals, and damaged screens. Ensure all windows and door hardware is operating properly. Check locks and strike plates making sure they are functional and secure. Inspect your attic for any sign of water penetration. Even if everything looks dry, make sure to also check ceilings and windows for any moisture as well as there could be a breach in the seal or a leak from interior pipes. If you have stairs or railings, check for any loose or damaged parts. Test smoke alarms and keep enough batteries on hand to replace all every 6 months. Inspect any tile flooring for chips, cracks or missing grout. Also, check to see if any tiles sound ‘hollow’ as they may have become displaced and loose. Check caulking around showers, bathtubs, sinks and toilets. Check foundation and any chimneys for deterioration. Inspect wood surfaces for weathering, paint failure or soft spots due to wood destroying organisms or water damage. Check decks, porches, stairs and railings for any loose or worn parts. Walk the entire structure after a heavy rain looking for any pooling water near your foundation. Check for any missing, loose or damaged shingles and flashing. Inspect fascia and soffits for damage. Clean and test gutters and downspouts for any leaks or weak areas. Clean and change any furnace or air conditioning filters. Remove any materials or buildup that may be blocking your air handler or return vents. Service your a/c keeping it in tip-top shape for the warmer months ahead! Examine any supply valves and your hot water heater for leaks or corrosion. Inspects sinks, showers, toilets and tubs for leaks. Making sure all faucets are secure and not loose or wobbly. Check any lawn sprinklers or well equipment for leaks and make any necessary adjustments. Check for any exposed wiring or for damage or wear and tear. Test circuit breakers and ground-fault / arc-fault interrupters. Don’t just stop on the interior…test and take a look at all outdoor outlets and any additional structures such as sheds or workshops. Taking the time to occasionally inspect areas of your home that are not always at the fore front can save you TONS of time and money down the line. Look for our Fall Prep Checklist as the summer months start coming to an end so you can get ahead. Winter is Coming! 🙂 And, of course, if you have any questions or would like any additional information, never hesitate to contact us! We are always here to help whether on a call, through email or in the office!